New images from NASA's Juno spacecraft show an unusual "footprint" of Jupiter's moons on their parent planet's aurorae. The data reveal that, rather than casting one "shadow" in Jupiter's aurorae, the moon Io – Jupiter's fifth – casts several, in a double wing-shaped pattern, while Jupiter's largest moon, Ganymede, casts a double shadow. The stunning phenomenon of aurorae – beautiful colorful tendrils above the atmospheres of planets – occurs when electrically charged particles accelerate along the planet's magnetic field lines and then interact with the upper atmosphere. Jupiter's massive moons alter this phenomenon on the gas giant planet by directing the streams of charged particles. The image above captured during Juno’s third orbit around Jupiter, is inset with an image of Earth’s south pole aurora, approximately to scale, collected September 11, 2005. 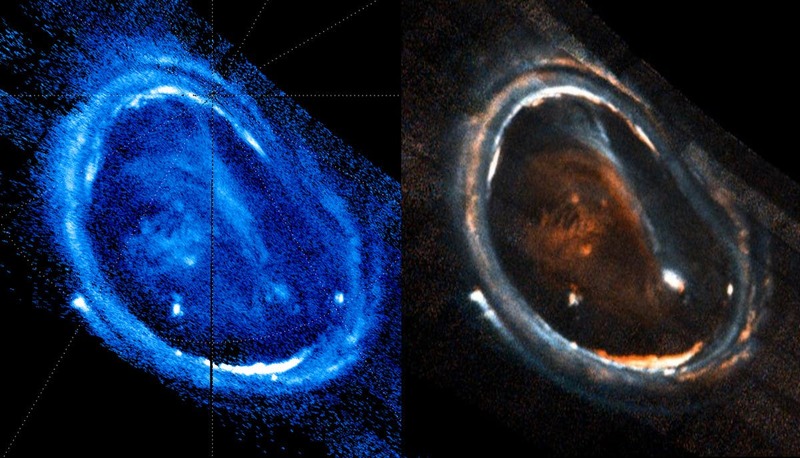 The streaky colors away from the Jovian auroral region are associated with penetrating electrons. (NASA / Southwest Research Institute). Two versions of an image of Jupiter’s northern aurora shown below were obtained by Juno on December 11th, 2016. The left panel shows auroral emissions on the basis of overall intensity, while the right panel overlays three different UVS wavelength ranges. G. Randy Gladstone (right image), and Bertrand Bonfond (left image). These large lunar bodies decorate the planet with unusual auroral patterns, previously seen as a bright spot "footprint" of each nearby moon in Jupiter's north and south hemispheres. 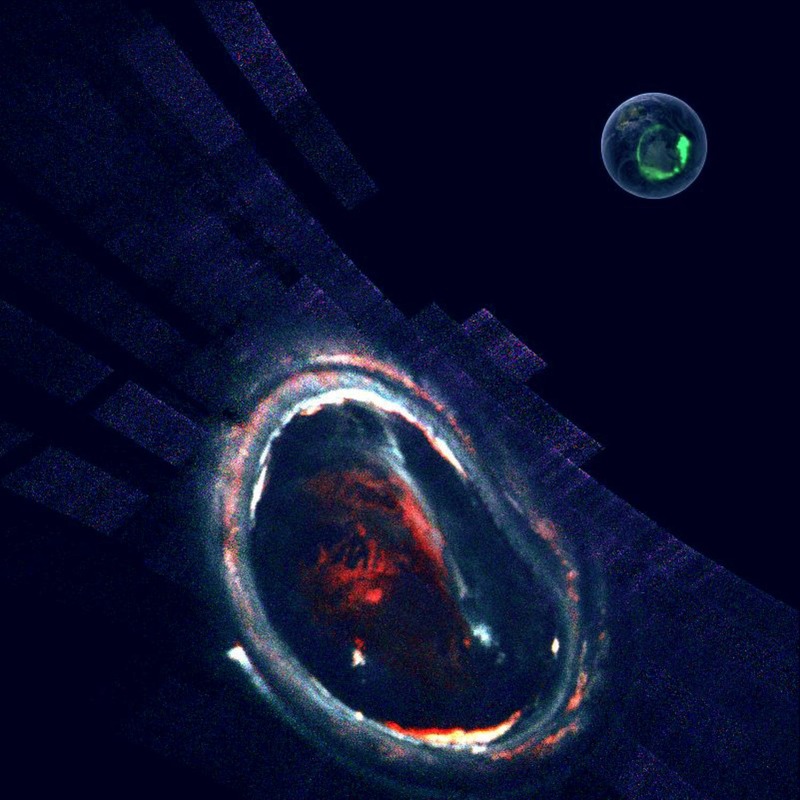 Alessandro Mura and colleagues use new images from the Juno spacecraft, which provide much more detailed data on the planet's aurorae, to reveal not just one "footprint" from the moon Io, but a trail of many evenly spaced bright spots that are roughly the size of the moon itself. The pattern created resembles a trail of swirling vortices in both hemispheres, one that sometimes splits into two wing-shaped arcs. Similarly, the researchers found that the moon Ganymede generates a double auroral footprint, that was not previously observed. The authors speculate that these unusual patterns could be caused by magnetic interactions close to the moons, or by interference between giant waves of electrical particles.